In his mission to create art through photography, associate professor Eric E. Sung has traveled with students to Death Valley, to Ecuador, and to Japan. He learned to operate a drone camera so his students could study architecture from an aerial perspective. He even became a certified scuba diver to photograph landscapes under the sea. Sung loves to dive in winter, when the water off Beavertail State Park in Jamestown, R.I., is so still that objects are crystal clear. Sometimes he emerges with his dry suit covered in ice and snow. “Every decision for me is dictated by my photography,” Sung said. “A lot of people can dive, and a lot of people can do photography, but not a lot can dive and also do photography, and those who do are photographing fishes. So much more can be done underwater. Sung’s ability to teach students how to see, and to document what they see through photography, was recognized when he was selected to receive the 2017-18 Joseph R. Accinno Faculty Teaching Award, Providence College’s highest teaching honor. Administered by the Center for Teaching Excellence and the Teaching Award Selection Committee, it is awarded each year to the faculty member who best exhibits excellence in teaching, passion and enthusiasm for learning, and genuine concern for students’ academic and personal growth. Eric Sung, associate professor of photography, is the 2017-18 recipient of the Joseph R. Accinno Faculty Teaching Award, the top teaching honor at Providence College. “Professor Sung has been one of the most influential people I have met at Providence College — he has completely changed the way I approach art and look at the world around me,” said Catherine Day ’19 (Rehoboth, Mass. ), a studio art major with a concentration in photography, who studied in Florence, Italy, during the fall 2018 semester. Sung received the College’s first Innovation in Teaching Award in 2016-17. He especially enjoys teaching interdisciplinary courses. His willingness to connect with faculty and students beyond his department made him the natural choice to be program director for PC’s new Business Innovation minor. Designed for non-business majors, the minor combines courses in accountancy, computer science, and art and art history, and features four tracks: organizations and entrepreneurs, global engagement, applied science, and design thinking. Offered for the first time in September, it has already attracted 70 students. Olivia D’Elia ’19 (Watertown, Conn.), a studio art major with a concentration in photography, said the art department at PC is a close-knit group. 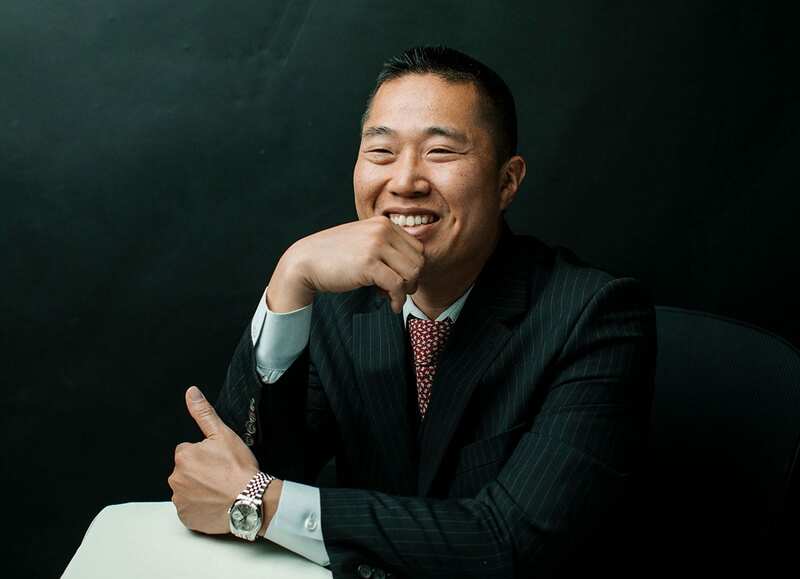 In May, Sung will accompany 26 students to Hungary and Germany through a Maymester course, Flashpoints: The U.S. and the Cold War in Eastern Europe, which he will teach with Dr. Margaret M. Manchester, assistant professor of history, and Dr. Eric D. Bennett, associate professor of English. The group will study the impact of the Cold War on European and American culture through architecture, art, and music. Six-week Maymester courses, which begin in May after the academic year ends, combine classroom instruction and international travel. In 2017, Sung went to Japan with Dr. Colin Jaundrill, associate professor of history, to teach Japan and the U.S. from 1853 to the Present. He now is planning a 2020 Maymester course trip to his native South Korea, which would be a first for PC. “I learn a lot from the other professors, and our students learn how much they can do simply by reaching out to people with different perspectives and fortes,” Sung said. Sung has made two trips to Ecuador as part of Visualizing Peace and Justice, a course that explored how art and photography can bring about social change, engage political activism, and create spaces for reconciliation. He often travels to New York City with students to visit the Metropolitan Museum of Art and small, for-profit galleries that contain cutting-edge works by emerging artists. 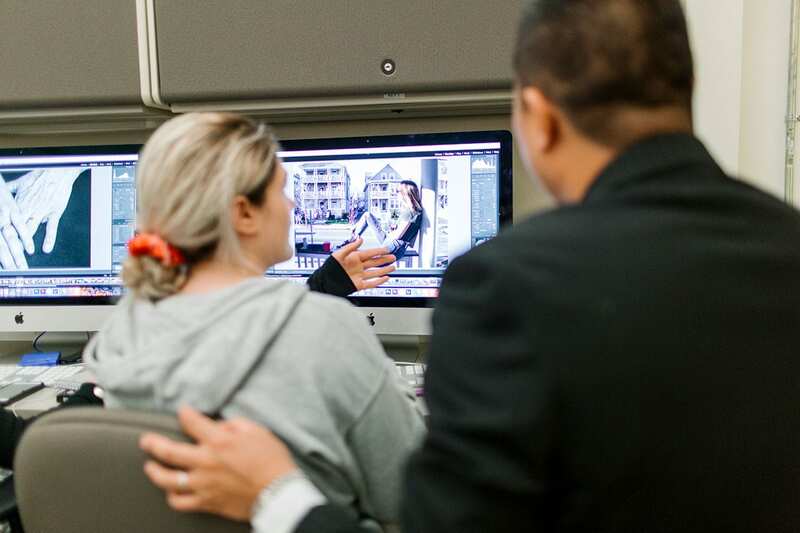 Eric Sung, associate professor of photography, helps a student edit a digital photo in the lab at Hunt-Cavanagh Hall. For a course called Development of North American Architecture, which Sung taught with Dr. Ann W. Norton, professor emeritus of humanities in art history, he introduced drone photography so students could see study structures from the air. He also used a drone camera in his Community Lens course, in which students venture into the community to help local children photograph their neighborhoods, and in Digital Workflow in Large Format Photography, in which students learn to create mural-size, detailed portraits and architectural photographs. The point is not to teach students how to use a drone camera, but to let them see from a different perspective, Sung said. He prefers not to teach courses based on software or machines because students learn more about the operation of the machine than what they can do with it, he said. At PC, photography students have access to both a digital darkroom and a film darkroom in Hunt-Cavanagh Hall. When Sung joined the faculty in 2008, he could have chosen to have the chemical darkroom demolished, but he opted to keep it. 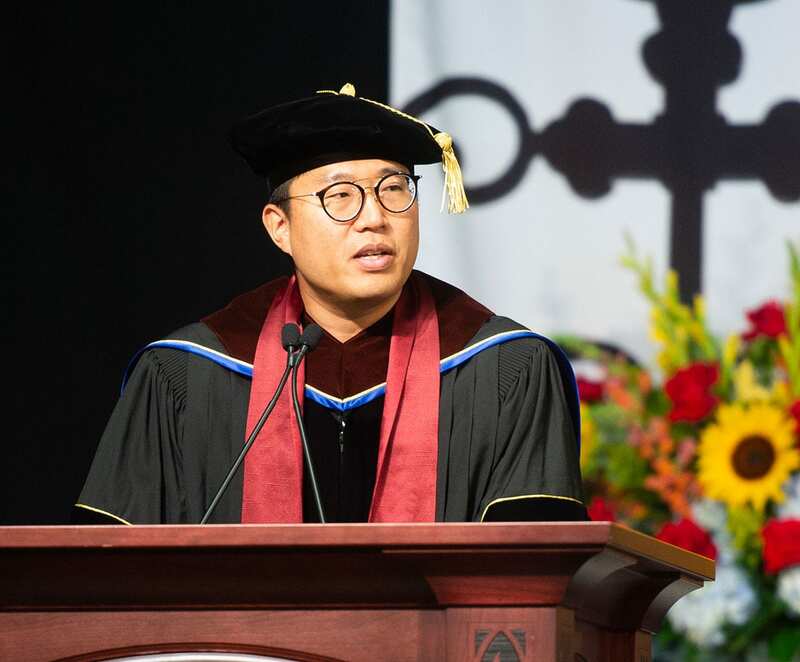 Sung learned about technology in graduate school at the University of Indiana in Bloomington, where the darkroom was all digital and students were expected to become “web and GIF designers, digital photographers, and geniuses at digital imaging,” he said. Eric Sung, associate professor of photography, addresses students and parents during the Academic Awards Ceremony for the Class of 2018. Sung didn’t start out to study art. Born in Seoul, he was 15 when he moved to New Jersey with his family. In college, he planned to study business administration. During his first year at Richard Stockton University, a primarily liberal arts college like PC, Sung took an art course with Michael McGarvey, an illustrator and graphic designer. Sung didn’t own a camera until college, when he bought a Canon, a film camera. Then he saved his money from summer jobs to invest in a Hasselblad, the camera that Neil Armstrong brought to the moon. It cost him $8,000 at the time. Sung attended a post-baccalaureate program at the Maryland Institute College of Art, then decided to pursue a master’s degree. He was one of only two students accepted to study photography in a three-year master of fine arts program at Indiana University. In addition to technology, the program introduced Sung to the benefits of working with other academic disciplines, and to teaching. Sung was offered the opportunity to teach not as a graduate assistant but as an instructor, the equivalent of an adjunct faculty member. He taught Introduction to Photography to undergraduate students. “I decided to do it because I wanted to understand a younger student’s mindset,” Sung said. “I wanted to see whether I could explain to others what is profoundly obvious to me. That’s what teaching is, really. I liked the dynamic. As a professor, he is always learning. After studying scuba diving with a private instructor, Sung practiced in the pool at PC’s Taylor Natatorium.